When a Link Monster’s effect is activated that targets this face-up card on the field (Quick Effect): You can destroy this card, then make 1 face-up monster on the field unable to attack, also it has its effects negated. During the End Phase, if this card is in the GY because it was destroyed on the field by battle or card effect and sent there this turn: You can Special Summon 1 “Rokket” monster from your Deck, except “Anesthrokket Dragon”. You can only use each effect of “Anesthrokket Dragon” once per turn. Blasting off this week on CoTD with “Rokket” archetype, starting with Anesthrokket Dragon. All Rokket monsters have the same Special Summon a “Rokket” from the deck when they hit the grave in the End Phase of the current turn, so we’ll skip that from here on. Anesthrokket can destroy itself to render a monster on the field unable to attack or use its effects for the rest of the turn. Anesthrokket is a one-turn Skill Drain and Nightmare Steel Cage for a monster. It has to be targeted by a Link Monster to activate this effect, but this effect can stall your opponent or force them to lose out on a monsters effect(s) and attack for the turn. Super strong DEF at 2200 and One-For-One synergy. While you can’t target the Borrel Link monsters, there are still monsters you are now forcing your opponent to rethink using their effects on. Even if you don’t get to use the effect, the fact that all Rokket monsters replace themselves when destroyed ensures you’ll at least get a fair trade for your monster. Combine that with Boot Sector Launch and you could be quickly overpowering your opponent once your grave is full. I went to Bill and asked if we could look over more VRAINS anime archetypes and it seems Alex picked the week and went with Rokkets, so that’s nice. The entire week we will look at the 5 Rokket monsters so far, 6 when we get Rokket Synchron in Savage Strike. For now we are starting with Anesthrokket Dragon. Anesthrokket Dragon is a Level 1 DARK Dragon with 0 ATK and 2200 DEF. I’ll spare you the rest of the week with how good DARK and Dragon is, especially after Savage Strike in the case of Dragon. 0 ATK is always poor, but 2200 DEF is outstanding on a Level 1. When a Link Monster’s effect targets this face-up card (Quick Effect), you can destroy this card then make 1 face-up monster on the field be unable to attack and have its effects negated. Basically making a monster useless on the field can be very useful to you. 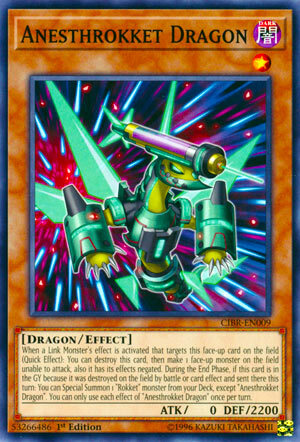 This can shut down a disruptive monster effect your opponent controls so you are more free to make your plays, the only thing is that when you target this with something like let’s say Borreload or Borrelsword Dragon, you might of already made your plays unless you use this in a future turn. Summon Sorceress can target a Rokket, but it will be destroyed so I don’t think Summon Sorc will summon anything from the deck since it won’t have a Type to check for really, and there are better uses for Summon Sorceress. If the TCG had Booster Dragon, then you wouldn’t have to make really big plays like a Link-4 to trigger a Rokket. The Borrel Link Monsters are important to Rokkets cause they trigger the Rokket effects, which is why their targeting effects can’t be responded to by the opponent. Anesthrokket probably has one of the worse effects in this case compared to the others, but negation and attack prevention is still good. All the Rokkets also have effects that if they were destroyed in a turn, then during the End Phase of said turn you can Special Summon a Rokket with a different name from your deck, so this will be called the “Rokket Effect” for short, but this effect does synergize with the fact that the Rokkets destroy themselves when targeted by a Link Monster. The Rokkets are a nice archetype that I hope get more support, cause they have some potential to be better than what they already are. Anesthrokket Dragon is a solid choice to add to your Rokket arsenal. Art: 4/5 Is this Dragon about to give us a shot? Welcome to my Rokket week! Crunch said this was one of the themes he hoped we’d go over soon, so here we are. (This is my favorite of the three). Anesthrokket Dragon opens the week, a Dark, Level 1, Dragon with 0 attack but a beastly 2200 defense. For the unaware, these cards target Link Monsters, and destroy themselves to do various things, and they also let you Summon another from your Deck during the End Phase. More on those in a short though. First, ARD (for short) sacrifices itself when a Link effect that targets this face-up card (and this is a Quick Effect) to make one Monster on the field unable to attack, and said Monster also has its effect(s) negated. Logically, that Monster has to be face-up, but that’s hardly an issue. And, then, as also reference in the introduction here today, there is a second ability. When in the Graveyard, during the End Phase, so long as it was destroyed by Battle OR by Card Effect, so long (again) as it was sent there this turn, you get to Special Summon another Rokket card from your Deck, so long as it isn’t ASD. Both these effects are once per turn. We have a ‘little’ Monster, with great defense, negation in two ways, and a Special Summon ability. This is an essential cog in the Rokket Deck.